A clean pool is an inviting pool. 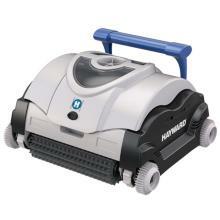 At Hayward, we have the ultimate Clean Team, offering a complete portfolio of automatic pool cleaners—ranging from robotic, suction and pressure. Our Cleaners offer many unique, patented innovations that drive superior performance, debris management and energy-efficiency. 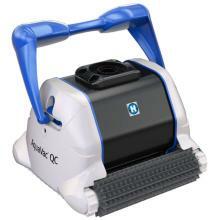 While other cleaners can lose suction, resulting in more work, AquaVac 6 Series cleaners maintain constant power at all times. Their 18 hydrocyclones form a swirling spiral of suction, creating more than enough strength to pick up even the most troublesome dirt and debris. 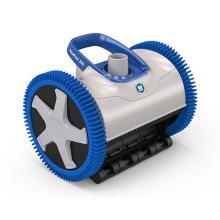 Not only do AquaVac 6 Series cleaners keep a pool spotless—they make clean-up simple, too. To remove debris, simply squeeze the quick-release latch and watch the canister empty and rinse itself. Engineered with 18 hydrocyclones, SpinTech™ filterless technology creates a swirling spiral of suction, maintaining maximum power until the job is done. HexaDrive™ adaptive traction expertly climbs and thoroughly scrubs walls with six rugged variable-speed-driven rollers that grip any pool surface. A TouchFree™ debris canister gets rid of the mess with the press of a simple quick release button—no filter or bags to clean, and best of all, you won’t have to get your hands dirty. Equipped with intelligent microprocessor-based technology, the AquaVac family is recognized for its superior performance in reliability and efficiency. 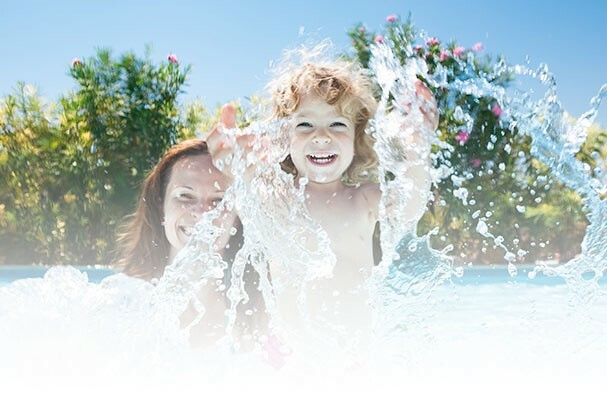 AquaVac makes sure virtually every area of your pool gets that much cleaner, and fast! Standard 3-hour complete cleaning cycle for full floor, walls, coves and waterline. 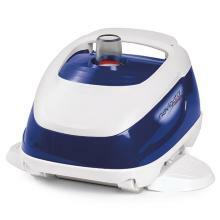 Patented Quick Clean technology provides a fast 90 minute cycle. 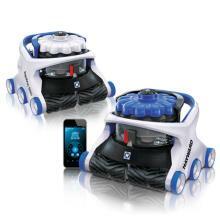 Makes emptying easy, just open the cleaner, remove the cartridge and rinse with a hose. Easy to use. Runs separately from the pool's filtration system reducing the frequency of filter backwash cycles. eVac Pro by Hayward is built with the highest-quality components and proven technology that create reliable, consistent results while maximizing energy efficiency. Whether you clean your pool floor, walls, coves and waterline with eVac Pro, the cleaners' robust, low-profile design and top-access filters give it an added bite. eVac by Hayward is built with the highest-quality components and proven technology that create reliable, consistent results while maximizing energy efficiency. While you clean your pool floor and coves with eVac, the cleaners' robust, low-profile design and top-access filters give it an added bite. 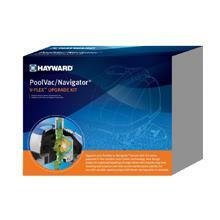 For full pool coverage including walls and waterline, try the eVac Pro. AquaNaut’s 400 suction pool cleaners are designed with unique patented technologies to deliver a thorough and reliable clean for pools of different shapes, sizes, flow rates and debris types. AquaNaut features patented self-adjusting variable vanes known as V-Flex™ technology. Because the variable vanes automatically adjust to allow for large debris to pass through the cleaner, V-Flex technology delivers maximum power even at lower flow and provides the peace of mind of clog-free cleaning. Patented adjustable roller skirt maintains optimal suction on uneven surfaces. AquaNaut’s 200 suction pool cleaners are designed with unique patented technologies to deliver a thorough and reliable clean for pools of different shapes, sizes, flow rates and debris types. AquaNaut features patented self-adjusting variable vanes known as V-Flex™ technology. Because the variable vanes automatically adjust to allow for large debris to pass through the cleaner, V-Flex technology delivers maximum power even at lower flow and provides the peace of mind of clog-free cleaning. Exclusive patented SmartDrive pre-programmed steering pattern offers unparalleled, reliable pool coverage, covering floor, walls* and coves. 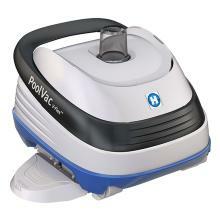 PoolVac V-Flex™ automatic suction pool cleaner delivers more power, reliability and performance than ever. Equipped with patented V-Flex variable vane turbine technology, PoolVac V-Flex can pick up larger dirt and debris more effectively than any other cleaner on the market for peace of mind of clog-free cleaning. It maximizes suction power even at lower flow-making it the perfect partner for use with variable speed pumps. Its unmatched patented AquaPilot® programmed steering determines the most efficient cleaning path around any pool and assists with cleaner maneuverability for the most reliable, complete pool coverage. Exclusive patented AquaPilot® pre-programmed steering pattern offers unparalleled, reliable pool coverage, covering floor, walls* and coves. 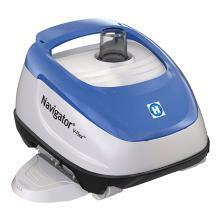 Upgrade PoolVac or Navigator suction cleaners with the latest patented V-Flex variable vane turbine technology. New design allows for improved handling of larger debris for virtually clog-free cleaning and maximizes suction power at low almost any flow - perfect partner for use with variable-speed pumps. All components within the upgrade kit improve the performance of debris handling, energy-efficiency, all with fewer moving parts to maintain. 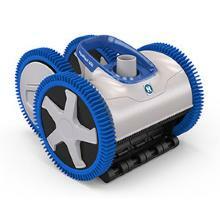 Patented V-Flex variable vane turbine technology allows your cleaner to handle larger debris. The variable vanes within the turbine adjust automatically to accommodate passage of this larger debris for virtually clog-free cleaning. The energy-efficient design of V-Flex also maximizes suction power at almost any flow, making it the perfect cleaner to pair with variable-speed pumps. Navigator® Pro's exclusive SmartDrive® programmed steering moves the cleaner silently in a predetermined series of turns for more thorough cleaning and is powered by an existing filtration system so pool owners don't have the expense of an energy-consuming booster pump.